Tropical Behavioral Ecology and Evolution class at the entrance to the Smithsonian Tropical Research Institute canopy crane, Metropolitan Nature Park, Panama City, Panama. Photo credit: Ryan McCarthy. 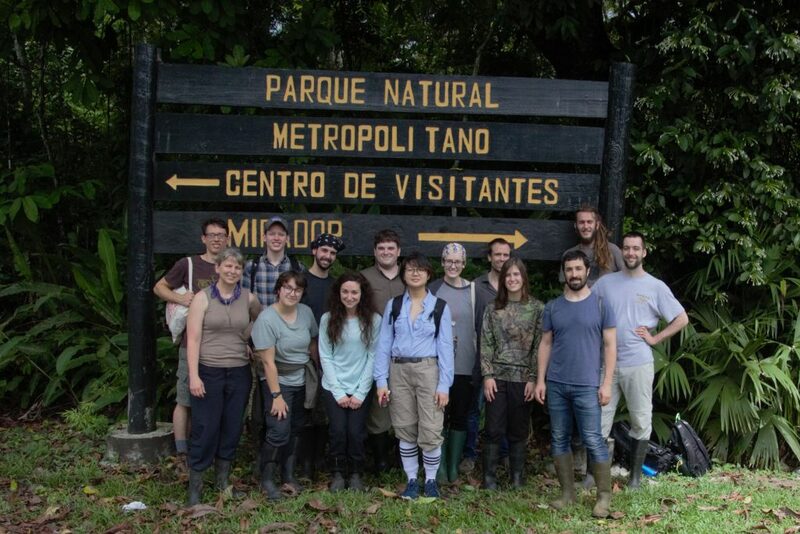 For the Tropical Behavioral Ecology and Evolution course in Panama, we established independent research projects, networked with the internationally-renowned Smithsonian Institution, got to know Panamanian culture, and made new friends. In addition, we had the opportunity to see some very charismatic Panamanian creatures, including the three-toed sloth (Bradypus variegatus). Attracted by their soothing movements, mischievous smiles, and tendency to hug things, I have long desired to see one of these slow, long-armed teddy bears of the jungle. The chance to see a sloth came during a visit to Metropolitan Nature Park, where our group was preparing to board a canopy crane. Suddenly, while waiting excitedly to be lifted into the tropical rainforest canopy, out rang the call of, “İPerezoso!” the Spanish word for sloth, which also means “lazy.” All attention was diverted to a nearby forest edge, where a baby three-toed sloth was descending vines and trees, moving toward the ground. Baby sloth pauses his descension from the canopy to consider EEOB students. Photo credit: Ryan McCarthy. We learned from one of the crane operators that sloths go to the ground to poop, a risky endeavor that makes them vulnerable to predators. It is thought that movement to the ground may benefit the moth and algae associates that live on a sloth’s coat, which the sloth relies on for camouflage. Regardless of its biological function, our group capitalized on the little sloth’s potty break as a photo opportunity. Adult sloth high in the canopy of an Anacardium excelsum tree. Photo credit: Ryan McCarthy. When the crane was ready to take another group into the canopy, we begrudgingly pulled ourselves away from the baby sloth. 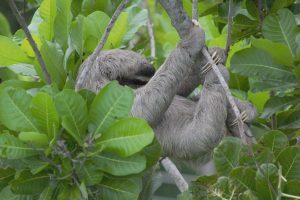 Little did we know that we would see mama sloth, poised in the canopy and waiting for her little one’s return! Our earth’s tropical rainforests are full of amazing biodiversity. The story of the sloth’s epic journey to the forest floor is just one of many biological sagas playing out in nature. You don’t have to go to the jungle to make amazing discoveries—check out a local natural area today! 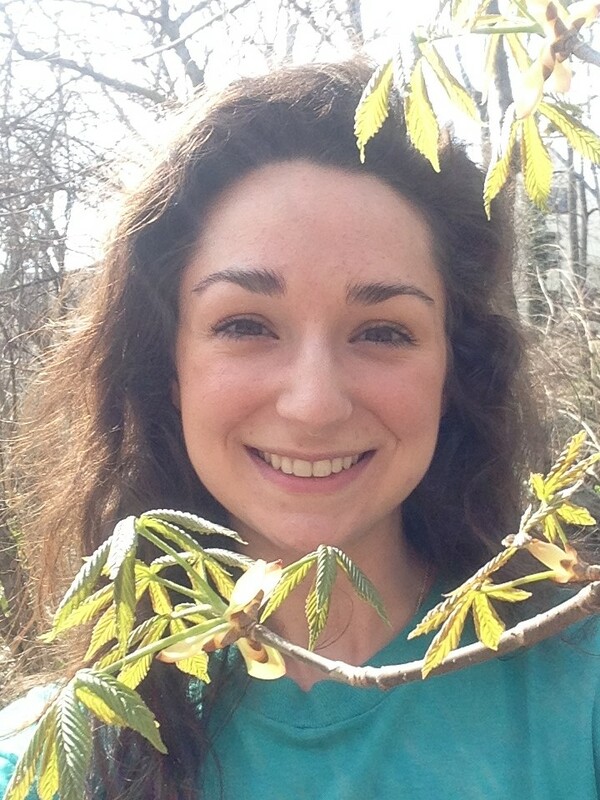 About the Author: Kali Mattingly is a PhD student in Steve Hovick’s lab studying population ecology and genetics of invasive plants. 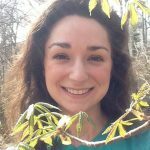 Kali recently participated in the Tropical Behavioral Ecology and Evolution course in Panama under Dr. Rachelle M. M. Adams and Dr. Jonathan Shik.